Have you been away from the Catholic community for a while? Are you feeling a strange inner pull to look into the Church again? That spiritual longing you feel is God drawing you back to Himself. God never forces; He only invites. He leaves the decision to return to the Catholic Church up to you. No matter how long you have been away from the Catholic Church, you can always come home. You can start going to Mass again and become a part of a parish community (find a parish) that is ready to welcome you with open arms. God is inviting you to dive into your faith, maybe even in a deeper way than you ever have before, to experience Christ's love and hope now and into the future. If you're interested in coming back to the Church or learning more about the Church, we're happy to try to help. Call us at 207-773-6471 or email comehome@portlanddiocese.org. 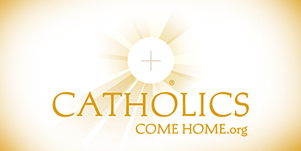 On Catholicscomehome.org you'll find answers to some common questions about the Catholic Church -- about Mary and the saints, about marriage and divorce, about the Mass and the sacraments, about confession. We've provided a few links below. You can also go straight to the source for understanding Catholic teaching by reading the Catechism of the Catholic Church or the United States Catholic Catechism for Adults . Either catechism will help you learn the teachings of the Catholic Church in a clear, straightforward and truthful manner. Check them out online or pick up a copy. The United States Catholic Catechism for Adults can be ordered through the USCCB website or on Amazon.com. Attending Mass is a wonderful place to start or renew your faith journey. it will give you a chance to spend time in prayer and maybe connect with the priest, a deacon, or a fellow parishioner. During Advent, we're all preparing for the birth of our Lord so it's a perfect time to join us. During Lent, we're all re-newing our relationship with Christ and the Church so that, too, would be a natural time to reconnect. Some parishes offer programs for those returning to the Church. Many offer special Bible study groups or hold small-group discussionsduring Advent and Lent. These are wonderful ways to learn more and meet new friends. The parish staff will be happy to connect you with the right people to get you started. Many events throughout the diocese are listed on the news & events section of our website (Click here). If you're looking to learn more about a parish or parish events, use the "find a parish" section. The parish pages list contact information including email addresses and include links to parish websites. The prayer and faith resources section of our website includes many helpful links including common prayers, the rosary, the Daily Mass readings and Echoing God's Word, a reflection on those readings. You'll also find links to Books of the Bible, and Saints of the Day. Perhaps you are feeling weighed down by the troubles in your life that have occurred while you were outside the Church. Christ wants to free you of that burden and offer healing through the Sacrament of Reconciliation. Check your local parish for confession times and make use of this healing sacrament as the beginning of your journey home. How do I find out about Catholic Christianity? One of the best ways is to contact a Catholic parish near you to let them know that you are interested in finding out more about Catholic Christianity. (See How do I find a Catholic parish near me? 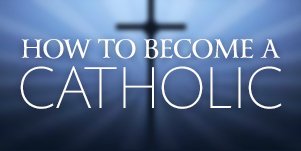 below) You will be invited to join with others like yourself as you inquire into what "being a Catholic Christian" is all about: who we are, what we believe, how we pray, how we live our lives, and more. What if I think that I want to become a Catholic Christian? We believe that God calls individuals to live the Good News Jesus proclaimed and to become his disciples as members of the Catholic Church. If you want to become a Catholic Christian, you will participate in a process called the Rite of Christian Initiation of Adults (sometimes called RCIA or simply Christian initiation). Adults or children who have reached the age of reason (about 7 years old) learn about the teachings of Jesus as the Catholic Church has handed them on and put these teachings into practice by living as part of the Catholic community, praying and serving others. What does initiation into the Catholic faith entail? If you have not been baptized, the Christian initiation process prepares you to become a Catholic Christian by celebrating what we call the sacraments of Christian initiation: Baptism, Confirmation and Eucharist or Holy Communion. If you were baptized in another Christian tradition, the initiation process prepares you to enter into full communion with the Catholic Church by celebrating the sacraments of Confirmation and Eucharist or Holy Communion. Finally, if you were baptized in the Catholic Church but never received any other sacraments, the RCIA process prepares you for the completion of Christian initiation by celebrating the sacraments of Confirmation and Eucharist or Holy Communion. How long does it take to become a Catholic Christian? Being a Catholic Christian is a life-long commitment. Therefore, in order to prepare to take this step, the Christian initiation process typically lasts from one to two years for the unbaptized, and from a few months to a year for baptized Christians from other traditions. Participants in the initiation process generally meet once or twice each week, including part of the Mass on Sunday, but each parish initiation schedule varies. The initiation of persons who are ready to become new members of the Catholic Church usually takes place at Easter (in March or April), although sometimes persons become members of the Catholic Church at other times throughout the year. You do not make any commitment or obligation by inquiring about Catholic Christianity or beginning the Christian initiation process. We want you to take the time you need as you think about becoming a Catholic Christian and we respect your decision to stop or to say, "not right now" at any time. While we love being Catholic Christians and hope that others will also want to become members of the Catholic Church, we do not exert pressure on anyone to do so. Our hope would be that at the very least, you would come to a greater appreciation of Catholic Christian beliefs and practices. How do I find a Catholic parish near my home or work? Use our online parish directory and search by county, town, cluster or parish name. God, help me to see your presence and hear your voice in my life. Guide me on my journey and lead me to you. Amen. For more information about Christian initiation, contact us at the Diocese of Portland’s Office for Lifelong Faith Formation 207-773-6471.